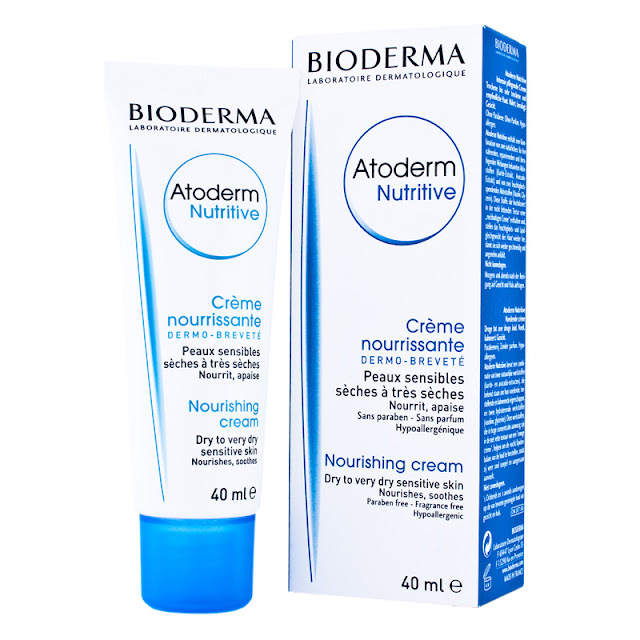 If your skin is dry, very dry, sensitive even atopic, and you are searching for cream, which can eliminate the unpleasant effects from the skin, but leaving it well moisturised, nourished, soothened - ATODERM NUTRITIVE by BIODERMA, is one of the possible solutions, which are really working. "A daily long-lasting high-nutrition facial treatment." When your skin has some of these characteristics, it's very difficult to find suitable skincare products, which can obtain the necessary balance, moisturising, soothing, nutrition, elasticity, comfort. 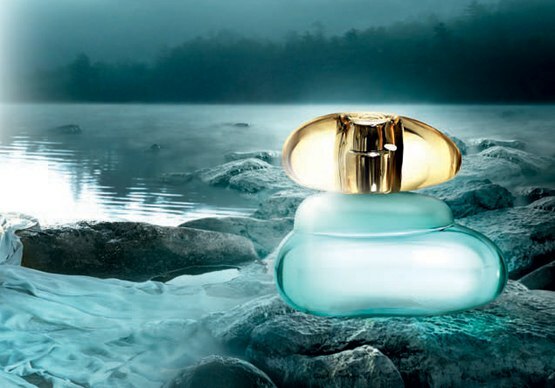 Despite of this, how many luxury and expensive products you may try, the relief can be only temporarily. Then, the only one option is to redirect, to the so called "medical cosmetics" or "derma cosmetics". Nowadays, we can find a large range of medical cosmetics products, on the market. Some of the most famous brands are - BIODERMA, PHYSIOGEL, URIAGE, AVENE, MIXA, LA ROCHE POSAY, DERMA E, DUCRAY, SEBAMED, TOPICREM and many more. ATODERM NUTRITIVE by BIODERMA is product from ATODERM line. "Through its Atoderm range, BIODERMA has an original solution for very dry to atopic sensitive skin. Thanks to its dermo-patented formulas, Atoderm biologically and lastingly restores the hydrolipidic film of skin lacking moisture and lipids." The purpose of this line is, to provide competent and long lasting helpful solution in skincare for dry, very dry, sensitive to atopic skin. 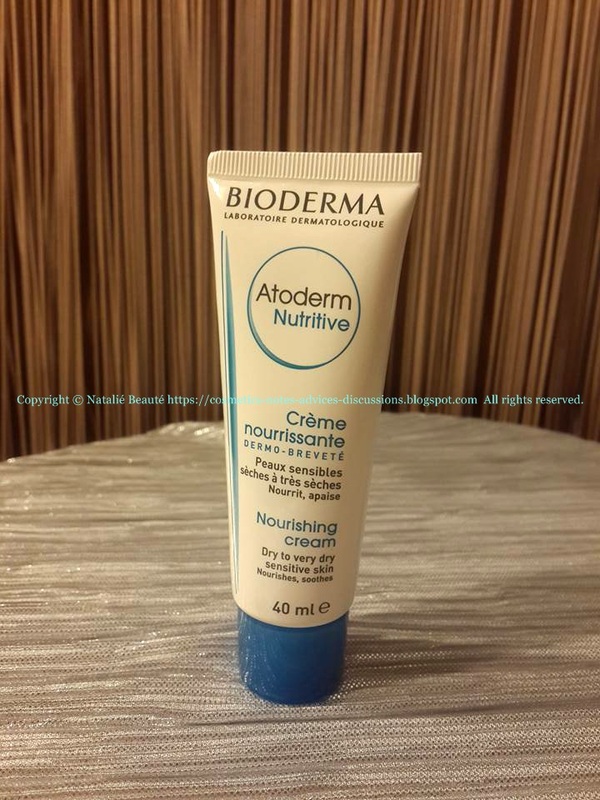 Highly concentrated in a non-greasy "rich creamy" texture, these agents allow Atoderm Nutritive to biologically restore the skin's water and lipid balance so that it quickly regains its original comfort and suppleness." This cream is providing long-lasting nourishing, elasticity, comfort for the skin. It can be used even from babies, according to the brand. It has very high skin tolerance. Can be used as day creme, as night creme, under your make-up, too. The skin absorbs it very fast. It doesn't leave any oily or unpleasant residue (as silicone film, for example) on the surface of the skin. 95% more moisture 2 hrs. after application*." It's texture is very light - not as usual cream. It's hypoallergenic, paraben-free, fragrance-free formula. It's non-comedogenic, non-greasy, non-sticky, non-shiny. You definitely feel your skin much better and its condition improves. 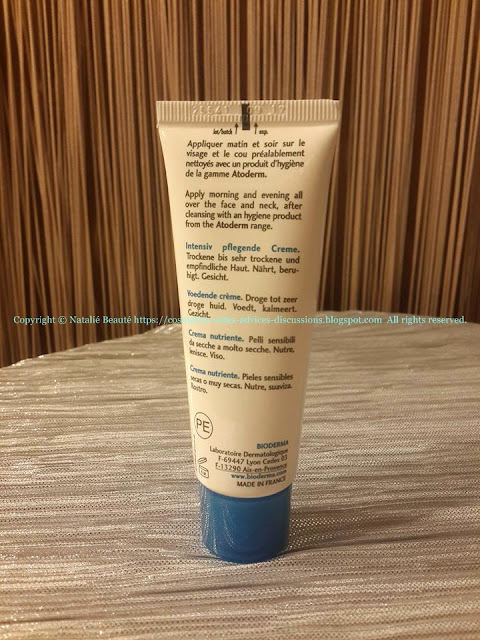 "AQUA/WATER/EAU, GLYCERIN, PARAFFINUM LIQUIDUM/MINERAL OIL/HUILE MINERALE, BUTYROSPERMUM PARKII (SHEA BUTTER), CETEARYL ALCOHOL, HYDROXYETHYL ACRYLATE/SODIUM ACRYLOYLDIMETHYL TAURATE COPOLYMER, CAPRYLIC/CAPRIC TRIGLYCERIDE, CETYL PALMITATE, PENTYLENE GLYCOL, MANNITOL, XYLITOL, RHAMNOSE, FRUCTOOLIGOSACCHARIDES, LAMINARIA OCHROLEUCA EXTRACT, SQUALANE, PERSEA GRATISSIMA (AVOCADO) OIL UNSAPONIFIABLES, PARAFFIN, CERA MICROCRISTALLINA/MICROCRYSTALLINE WAX/CIRE MICROCRISTALLINE, GLYCERYL STEARATE, PEG-100 STEARATE, 1,2-HEXANEDIOL, CAPRYLYL GLYCOL, CETEARYL GLUCOSIDE, ACRYLATES/C10-30 ALKYL ACRYLATE CROSSPOLYMER, POLYSORBATE 60, GLYCERYL POLYACRYLATE, DISODIUM EDTA, SODIUM HYDROXIDE. [BI 587]"
The product comes in plastic, white, non-transparent tube with dosator, non-sealed; in paper box, 40 ml. Very good product, high quality. It does, what it claims to do. It can be very good part from your daily skincare routine. Absolutely suitable product for the whole family.